The artist’s work is more interesting because of the egalitarian proposition behind it. Everyone loses teeth through the natural course of life, first in childhood and then into old age. Majerus cites the concept of Wabi Sabi, or the Japanese philosophy to cherish the unpretentious, the simple and the aged; the older you get the bigger your personal collection of tooth pearls grows. Unlike expensive and rare animal ivory – everyone has access to these little gems. And although the process of losing teeth or having them removed isn’t pleasant, the “harvesting” of human ivory is certainly less lethal to the person and the planet than that of the African variety. The crafting process involves collecting the teeth after extraction (Majerus has used her own teeth and that of her professors at Eindhoven), bleaching them to various shades of ivory color, then stone-polishing each tooth before creating custom accessories. 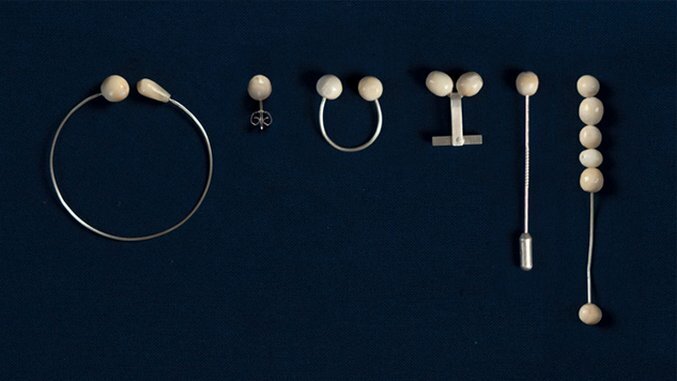 Majerus has put an intriguing spin on a time-old tradition: making jewelry from body parts. To put it so bluntly it sounds downright morbid. But there are many examples of beautiful decorative items made of human detritus in folk art and handmade crafts over the centuries. Victorians perfected the art of creating hair wreaths from the locks of the dearly departing (physically) and departed (spiritually). In the late 1800s, so many people were making hair wreaths that ladies magazines of the time would write columns about what twists, stitches and wire forms were the most stylish and efficient. Better Hair and Gardens, if you will. More recently, oddities artists have created pendants from resin and fingernail clippings. Like the ivory for a tooth ring, hair and fingernails have texture, hardness, color and beauty unique their owner. And they can be acquired by anyone at a non-lethal cost. “By wearing your own material it fuels food for thought about personal and material values,” says Majerus. Bone jewelry is nothing new and may never go out of style – sheep rib, bat skull and starfish necklaces can an enchanting element to an outfit. If you haven’t searched for human teeth jewelry on Etsy lately (or ever), you might be surprised at the selection. Lucie Majerus’ designs are much more elegant than what you’ll find there – but if you want one of her designs, the tooth fairy only works by bespoke commission.